Now that I’m redoing the Sunrise, I’ve decided to work on all the little things that could have been done better the first time around. I’m also being as OCD as humanly possible—I’ve already taken part of the sleeve out once! (I forgot which M1 was R and which was L, but went ahead without checking, and turned out to have had them backward. This would have meant nothing in the grand scheme, but I wanted it to be right. My boyfriend gave me an intense ironic face and said “this is for your mother. are you going to settle?” :) ). So anyway, fixing the k2togtbls is a high priority, because they’re all fat and ugly in the original (look along the right shoulder of the jacket, to the left in the photo, here)—it’s a constant problem for me all the time with those ssk/k2togtbl decreases. * A standard k2togtbl. 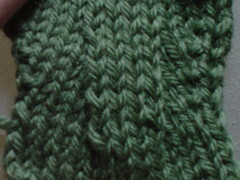 I was trying to keep the stitches only on the tips of the needles, but I’m not sure how successful I was. This stitch looks big to me, and it’s exactly how all the stitches on my completed Sunrise look. * An ssk. For this one, I slipped just the first stitch knitwise, then k2togtbl. * A true ssk. Here I slipped both stitches knitwise and then k2togtbl. 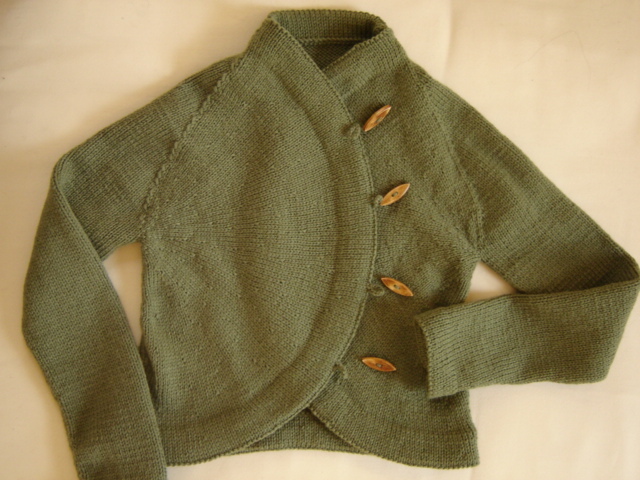 * An off-standard k2togtbl in which I worked the purl row before differently: I wrapped the yarn backward on the two stitches that would be knit together, so that when I came to knit them they were already turned and the tension was taut. I got this tip from the Knitty boards. I didn’t try an ssk in which I slip the first stitch purlwise and the second knitwise; I should have tried that. But I kind of doubt that it will fix the problem any betterâ€”it’s the first stitch that always ends up looking ugly, and this method 1) manipulates the stitch more than might be necessary and 2) doesn’t actually change anything about that first stitch. I think the best two are the straight-up ssk (the 3rd from the bottom) and the off-standard k2togtbl (4th from the bottom), which are really just the same stitch but produced via different means. I think I’m going to use the method of the off-standard, mostly because it means less moving around of the stitches and because it won’t be hard to know where the two stitches that need to be wrapped wrong are. I could still use to finesse my purl tension vs. my knit tension for those stitches, but all in all this creates a nice, smooth, tight little decrease that I’m pleased with. Maybe this experiment will help you, too, the next time you have to do a left-leaning decrease! I hope so. That’s an interesting experiment – I always seem to have more trouble with my right-leaning decreases! I wish I had the patience, time and motivation to reknit Sunrise, there are so many things I could do better. Definitely concur on the k2togtbl, mine came out looking like yours did and I think the plain ssk is the best. I considering swapping to that once I’d done a few rows, but then I thought the k2togtbl rows would stand out too much from the rest. I also hoped a bath and blocking would work wonders. This hasn’t happened yet. Wow, thanks for the thorough review of those decreases! I can’t believe what a notable difference there is between them. I’ll have to that off-standard K2togtbl method sometime. I should read the knittyboards more, apparently. that off-standard k2togtbl looks great! I will be adopting it when I get to the decreases on my current sweater. Wow! Thank you for letting us benifit from your experiment.